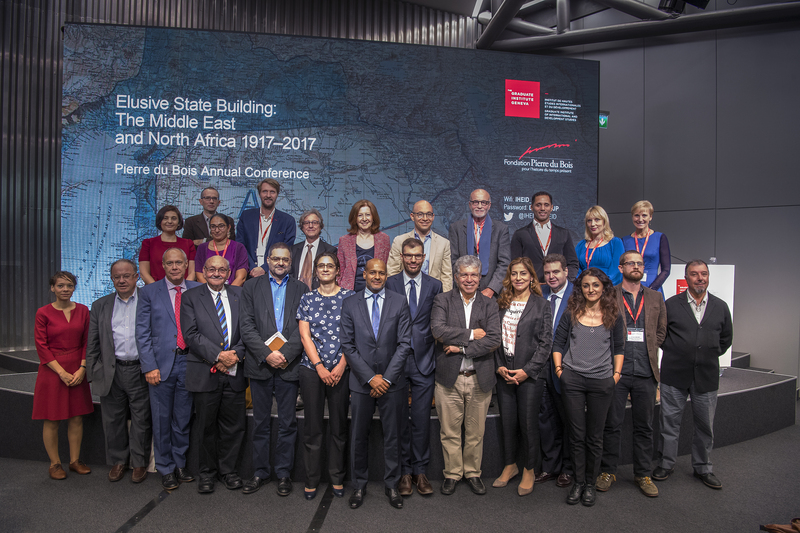 The 2017 Annual Pierre du Bois Conference, organized by the Graduate Institute in partnership with the Pierre du Bois Foundation, took place at the Maison de la Paix from 27-28 September 2017. The conference was organized by Professor Mohammad-Mahmoud Ould Mohamedou. At the centre of the conference was the modern-day state-building project in the Middle-East and North Africa, its challenges spanning a century of developments in the region and global influence on the contemporary scene. Here are links to the programme, background note, biographical notes of presenters and the photo gallery. Professor Mohamedou and several other participants discussed the conference in a video here. A conversation on “Orientalism Today” also took place between Hamid Dabashi and Mahmoud Mohamedou” which can be found here. For background on the Pierre du Bois Foundation and Conference please read the article in Le Temps from September 26, 2017 titled “Irina du Bois, les beaux jours“. A Keynote Lecture titled, Autoritarismes, Interventions et le Nouveau Grand Jeu au Moyen-Orient, was presented by Bertrand Badie of Sciences Po Paris on Wednesday, 27 September 2017. Please watch the video of the Lecture. Additionally there was an interview in Le Temps with Bertrand Badie on September 26, 2017 titled “Les Etats du Nord, prisonniers de leur puissance“. A detailed summary of the conference will follow shortly.